Neither do you mourn the loss of someone you never really lost, because their essence is branded deeply across the universe, in every heart and soul they encountered. No, these are not times for grieving, mourning and weeping. This is the season to celebrate. This is a time of thanksgiving. This is a period of rejoicing. Sing, dance and flow with joy that a star has transcended. I discovered Maya Angelou, as a teenager, between ages 14-15, through my high school principal-Mrs Mary Okobi(RIP) and what a wonderful ride, what an awesome blessing! I remember the first time I read ‘Phenomenal Woman’, it was this surreal, powerful and transcendent experience. I wept with joy and freedom that someone dared to see herself with such clarity and truth, and in doing us, invited us, her readers, to do same. Through the prism of her eyes, you finally see yourself as you truly are: you are unique, you are magical, you are somebody, you are special, you are worthy of unconditional love, you are beautifully and wonderfully created! She taught us to honour our truth by living it, unapologetically. The magic of Maya was that she made every one of us, young and old, man or woman, stand taller, a bit straighter, embracing our true selves and owning our God-given power, talents, gifts and abilities. She’s one of the many reasons why I’ll forever be grateful to Mrs Okobi. I have been blessed by great mentors and sisters-I salute them, phenomenal women, all! I refuse to mourn her transition, instead, I choose to rejoice and be thankful that we were blessed with her essence and her unique gifts. Let us acknowledge and embrace the truth that she exuded, lived and shared. Let us honour her by connecting with our core, finding and using our voice to SING our own unique song(s). I have often been fascinated with hymns and psalms and poems by the biblical King David. However, I’ve often secretly felt that he needed a woman to provide a blended perfect balance. 🙂 In my mind, as we celebrate her life here on Earth, Maya’s probably composing endless psalms and poems, laced with her effervescent glow, much to the delight of the entranced heavenly crowd. Someone’s definitely sharing a beautiful recital with King David, and the heavens are in for a great treat!! Co-create with love, as you’ve always done Ms Angelou and send some of that goodness in the sun rays, rains and stars that shine upon us. The preceding quote captures her life a nutshell. And one of the greatest gifts I got from this beautiful soul was the gift of UNCONDITIONAL LOVE! Indeed, Maya Angelou’s taught me the power and beauty of Love, Forgiveness, Originality, Presence, Creativity, Gratitude, Acceptance, Courage, Spiritual-Sensuality, Inner-Strength, Authenticity, Worship & Humour. Most importantly, she showed us eloquently and with a daring gracefulness, that we all share a divine connectedness and that the best way of leading, sharing and teaching others is simply by BEING. She was one with her message! I celebrate the magic, the grace, the sass, the master-class, the power, the majesty, the mystery, the wisdom, the presence, the ageless spirit, the phenomenal soul that was, is and always will be MAYA ANGELOU! I’ve always maintained, that along with daily vitamins, young women (and men) deserve a daily healthy dose of MAYA! My whole experience with the brilliance and magic of her written-spoken words and towering, empowering, yet gentle personality has been quite the adventure! In her words, truth was unveiled and revealed, and provided a healing balm in both difficult and wonderful times. She opened new worlds and vistas of possibilities to my young, innocent mind. One of the greatest compliments I’ve cherished in my lifetime is that I remind people of her. Each time I hear this (and yes, I’ve kept count..lol), the reaction is always the same, a beating of my heart, goose bumps all over my flesh and the serenity and calm that springs from a deep well of humility and gratitude. (Thank you Mrs Okobi, Lisa, Stacey, Ralph, Angel and Chika, Chiazor…) Your words mean everything and beyond! 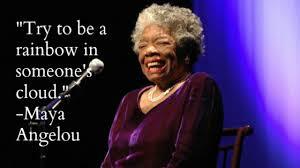 Rest In Peace, wonderful Spirit guide, Mentor, Poet, Seeker, Wise One and teacher! 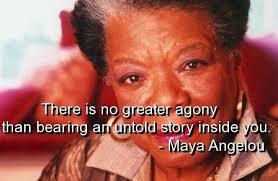 Rest In Peace, Phenomenal being and beam of light and love, Rest In Perfect Peace, Maya Angelou!